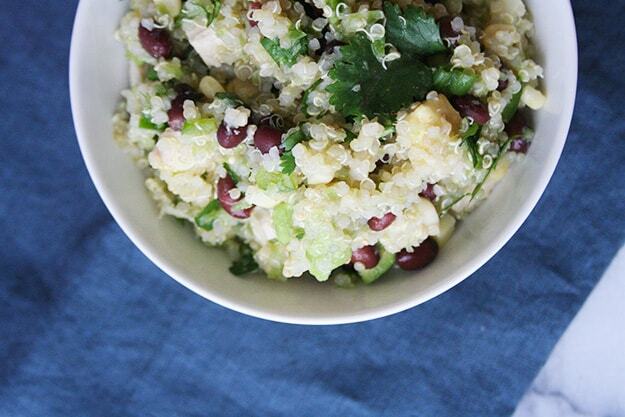 A simple, healthy, and fresh chicken avocado quinoa salad with tomatillo dressing to celebrate Cinco de Mayo – just add a margarita! Happy Cinco de Mayo week everyone! Not that I need another reason to eat Mexican food because I could srsly eat it all day, every day. But now I just feel a little less guilty about it because it’s a holiday and it would be crazy to not eat Mexican food on Cinco de Mayo. This salad was originally eaten by my sisters and I in mass quantities during the summer of 2007. The summer before I headed off to college and the summer that mom received the best Cooking Light magazine of all time. In general, I am not a huge fan of CL, but this particular issue was loaded with recipes we’ve made again and again. Thai Chicken Lettuce Wraps with a Spicy Peanut Sauce – and you all know my love of Thai peanut sauce. Nectarine and Chickpea Couscous Salad with a Honey Cumin Dressing – this salad spurred my love of chickpeas and cumin. 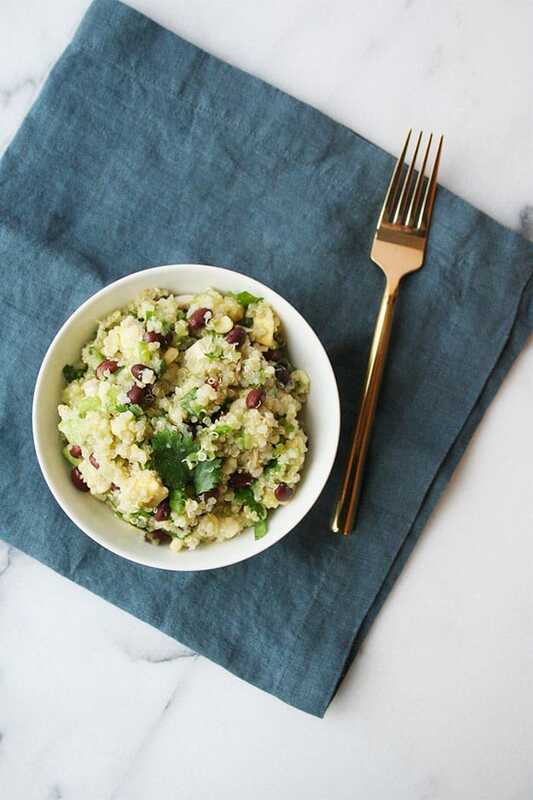 Chicken Avocado Couscous Salad with Tomatillo Dressing – the salad I have made for you today (with just a few alterations). The two couscous recipes were found on the same page in the magazine and I vividly remember having my mom make a photocopy of that page. She later emailed the photocopy to me and I very smartly saved the email in my ‘Recipes’ folder. I had this whole adulting thing figured out – or so I thought. Then I got a new email to accommodate my married name and LOST THE RECIPE FOLDER. So much for my refined folder system. Luckily, we have this lovely invention of the internet and I found the recipe through an old Cooking Light forum. Look at all that goodness! I very slightly changed the original recipe, but kept all the beautiful and bold ingredients. This salad is bursting with deliciousness and really healthy, good-for-you foods – chicken, avocado, black beans, sweet corn, cilantro, jalapeno, and the tomatillo sauce. I swapped out the couscous for quinoa (because quinoa is SO good for you) and doubled the amount of cumin, because… cumin. Oh it is SO good. 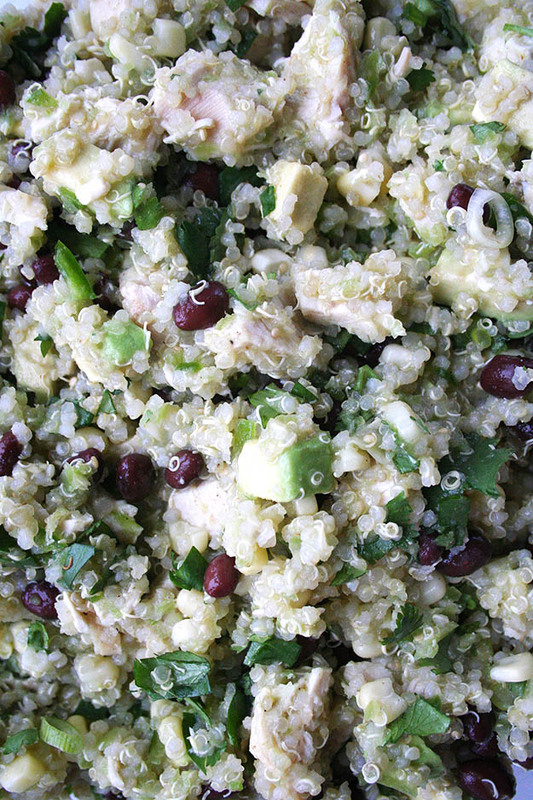 All you need is a margarita and this Chicken Avocado Quinoa Salad with Tomatillo Dressing and your Cinco de Mayo is complete! If you make this recipe and post on social media, make sure to tag me by using the hashtag #imhungrybynature! Bring 2 cups of water and quinoa to a boil in a saucepan; place on the lid and let simmer until the water is absorbed, about 15 minutes. Fluff with a fork and let cool. 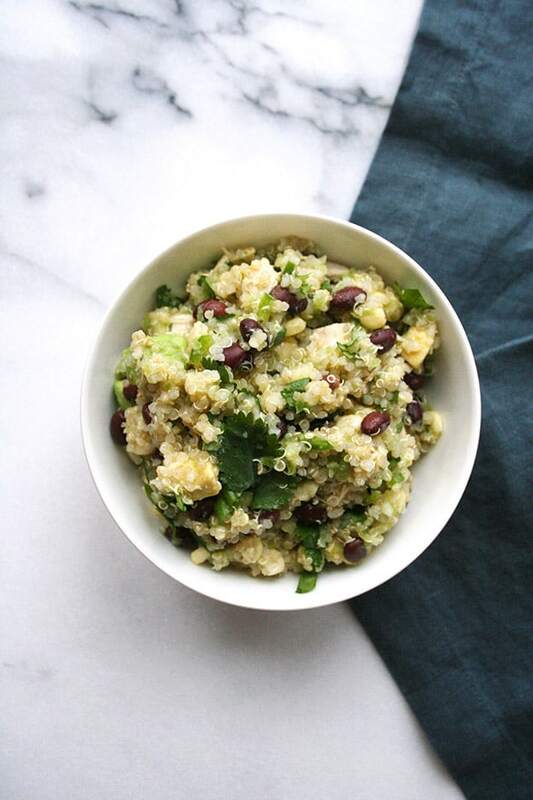 While the quinoa is cooking, make the dressing. Place tomatillos in a food processor; process until chopped. Add lime juice, olive oil, and sugar; process until smooth. 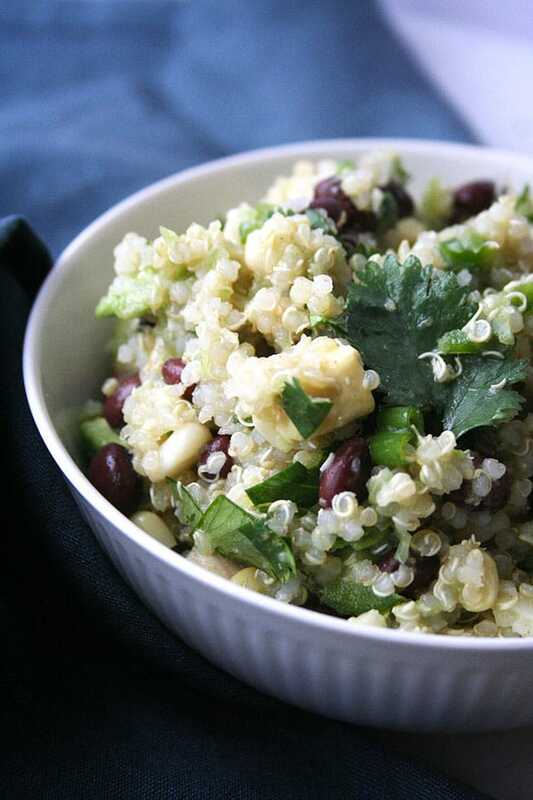 After the quinoa has cooled, combine quinoa, tomatillo dressing, chicken, and remaining ingredients in a large bowl; toss gently. Shake up that marg and dig in! Great minds is right!! The tomatillos are so fresh and bright – just perfect for the dressing! Tomatillos are this hidden gem that my family is obsessed with! We add them into anything that it somewhat makes sense to do so! I love them, but totally don’t use them enough! This looks delicious! I am a huge fan of adding avocado to salads recently! Thanks Dani! I know – isn’t it the best?! If you make it, let me know what you think!! Owww yeah throwback to ’07! This looks like the PERFECT quick and healthy lunch! I love it! Thanks Chrissa! It’s one of my fave summer recipes and it keeps great for lunch leftovers!